Laker, mackinaw, lake char, touladi, grey trout, togue. The look of a lake trout varies depending on the body of water. Typically they are dark-colored, ranging from black to green, with white spots spread out over their body, head, tail, and fins. It has a rounded head and a deeply forked tail, unique from most other trouts and salmon. Lake trout are by far the biggest fish among trout and char, the biggest a recorded 102 pounds (46.2 kg), caught in a gill net on Lake Athabasca, Saskatchewan. Only on larger lakes do lake trout even break the 50-pound barrier and grow bigger than 3.5 feet (1m), as on smaller bodies of water lake trout typically grow to be between 14-17 inches long (35-43cm). 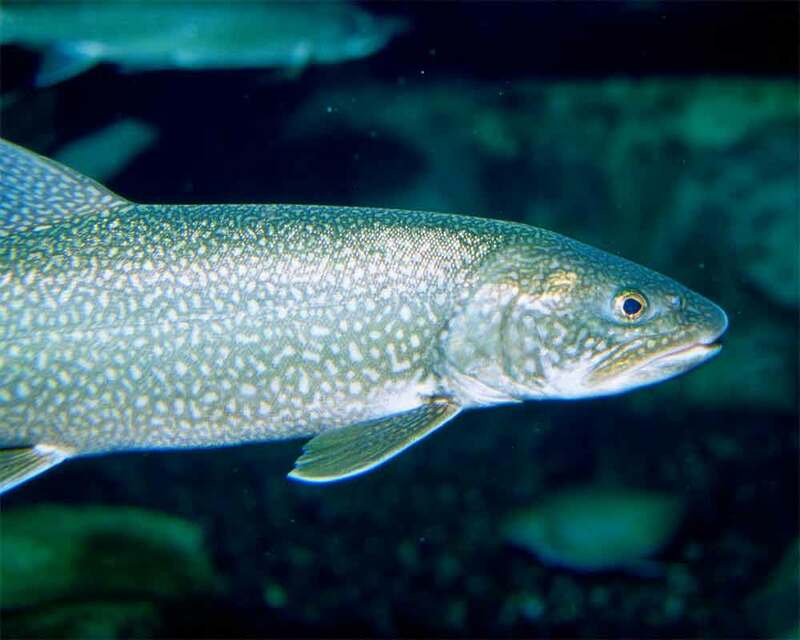 Lake trout are most abundant in Canada, where they are found in most provinces and territories, especially in Ontario where they are most widely distributed. Lake trout also inhabit lakes throughout several northern states from east to west. Lake Superior contains the largest population of native species on the continent. Lake trout thrive in cold waters of about 50 degrees Fahrenheit (10° C), preferring large, deep lakes. They tend to be in lakes with depths greater than 50 feet (15 m), though in the far north they inhabit smaller lakes due to the year-round colder temperatures. Lake trout on bigger lakes have been reported to reach nearly 70 years of age, although 10-20 is more typical for fish that reach maturity. Fast over the first five years. Lake trout are daytime feeders that feed almost exclusively on smaller fish once they grow mature. Whitefish, sculpin, minnows, and even other lake trout if prey is scarce. Younger lake trout feed on insects, crayfish, and worms dug out from the bottom. Lake trout reach maturity anywhere between 5-10 years. Females lay their eggs in the fall, choosing water that is 6-10 feet (2-3m) deep and close to the shoreline. typically, lake trout spawn on gravel to protect their eggs, as well as someplace with some water movement to ensure steady oxygen. Despite their size, lake trout lay eggs in lower quantities than other lake fish species, and some females don't even spawn every year. Both male and females tend to return to their origin of hatching when spawning. A mature lake trout has few predators given he depths it tends to swim. When younger, northern pike and other lake trout pose the biggest threat. Credit for information above: Fisheries and Oceans Canada and Ontario Ministry of Natural Resources. Lake trout is a highly sought after fish because not only do they make for a delicious meal, they are quite exciting to catch as well. Interestingly enough, they have been nicknamed the poor man's lobster. Its attractive features have often led to overfishing, prompting some areas to place strict regulations on anglers and commercial fishing. Some areas have number limits; other regions have a catch-and-release policy. When trout fishing in America or Canada, it is always a good idea to check the local regulations for fishing times and limits.These fish are relatively rare around the world when compared to some other species. In North America, they are found in Canada, Alaska, and to a lesser extent northeastern United States. Around 25% of all lake trout lakes in the world are in Ontario, Canada. To get a better understanding of the rarity, only one percent of all Ontario lakes are lake trout lakes. Lake trout was also introduced to other parts of the world like Europe, South America, and some parts of Asia.Lake trout depend on cold and oxygen-rich waters. In the summer they live at depths of 65-200' (about 20-60 meters) to escape the heat. During this season, lake trout can be successfully fished by deep trolling, as the lines will effectively reach the depths where the trout spends its summer months. When the water is at cool temperatures during spring and fall, lake trout can be fished near shore, in shallower waters using artificial lures and flies. Fishing for lake trout during the day usually produces better results than by night. This is because they are able to see the bait a lot better during the day in the deep waters.One of the more successful methods to fish for large lake trout is to use spoons. Shiny finishes on spoons help to make them more visible in deeper water where lake trout usually live.Lake trout visit shallower waters during the spring and fall spawning seasons. For these conditions you can use a spoon, large inline spinners, lures, or bait.